A beautiful Christmas centerpiece can make your dinner table pop! Find 20 easy Christmas centerpieces ideas that are easy to make and budget friendly. Between the holiday shopping, planning, and execution of the Christmas Day festivities, decorating can be the last thing on your mind. A Christmas centerpiece can be an easy and festive way to make your table pop without a lot of work. I’m always amazed at the impact a simple centerpiece has on your table. It truly can pull everything together and have such a festive touch on the season. You will love how easy these ideas are. No need to spend hours looking for supplies and tons of money and even more time making these. 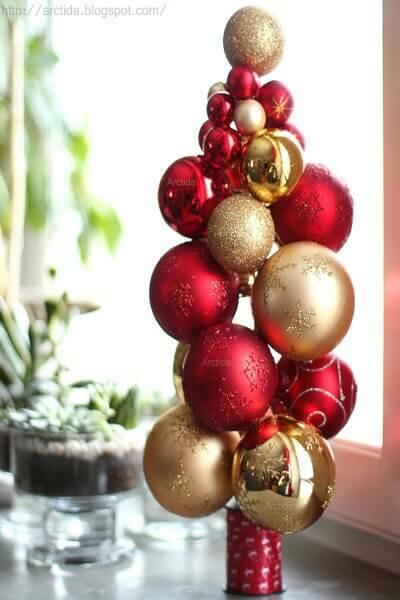 These Christmas centerpieces will make your home stunning for the holidays! 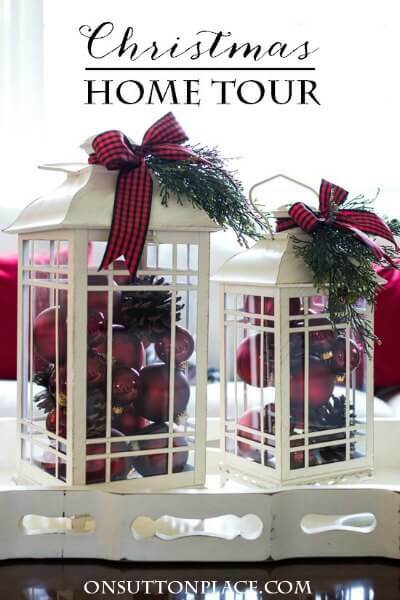 There are so many fabulous ideas to make your home festive for Christmas. 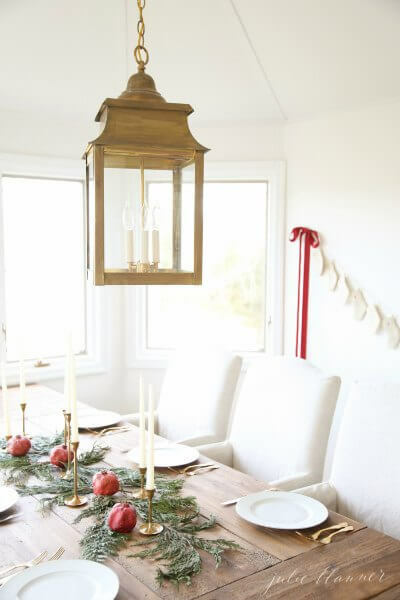 Your holiday table will be stunning with these Christmas decorating ideas. From floral arrangements to votive candles and faux snow, these eye catching Christmas table decorations are sure to impress. Whether you like simple ideas like mason jars with fresh flowers or glass balls and mercury glass, your dinner table will be gorgeous. It is amazing what a glass vase or glass votives can do for your table decor. You can use a candle centerpiece to fill a large table easily and on a budget. 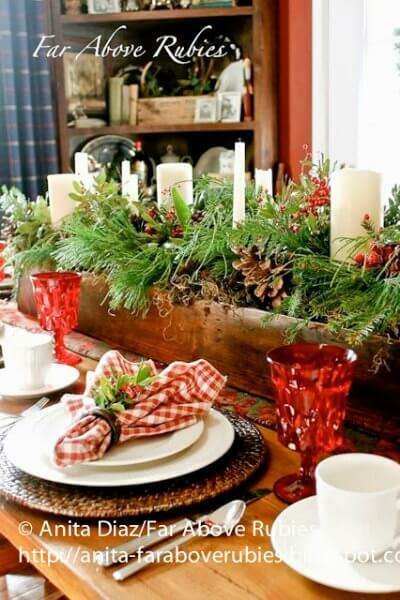 Your table decor will all come together with this festive holiday centerpiece ideas. 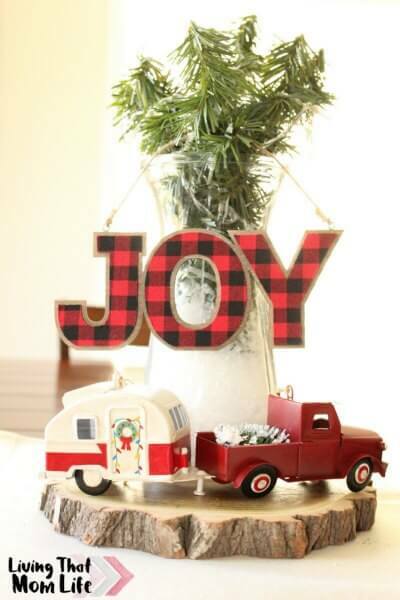 Choose a theme and tie it all together with your Christmas trees and other holiday decor. These DIY Christmas centerpieces are very simple to do even though they look fancy! Don’t let gorgeous centerpiece ideas scare you off. 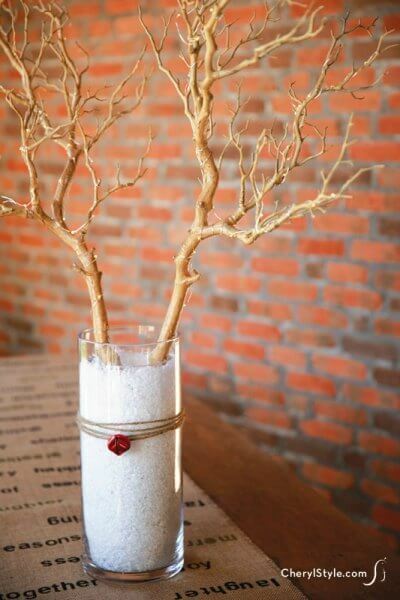 You can easily make these DIY centerpiece ideas. 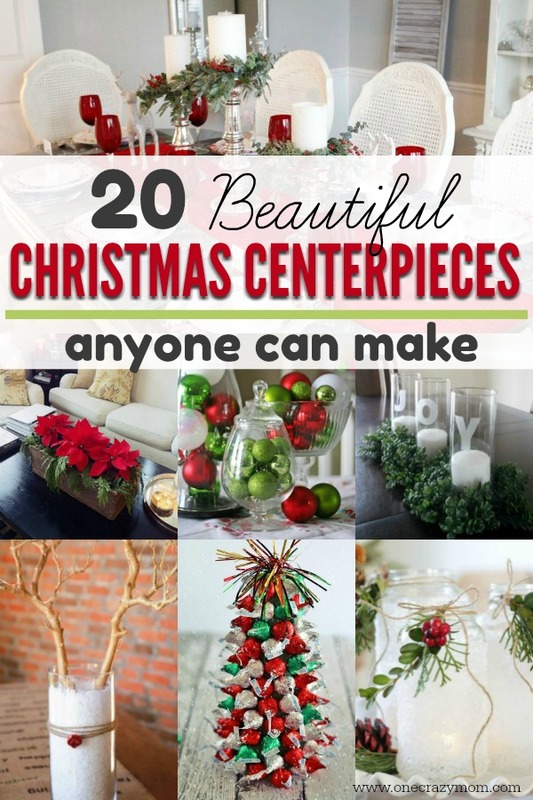 Here are 20 Christmas centerpieces that you will love! There is something for everyone. These ideas will make your home so festive with very little effort but leave a big impression. Whether you are throwing a holiday party or just need to spruce up the house for your family, you will find tons of ideas for everyone. 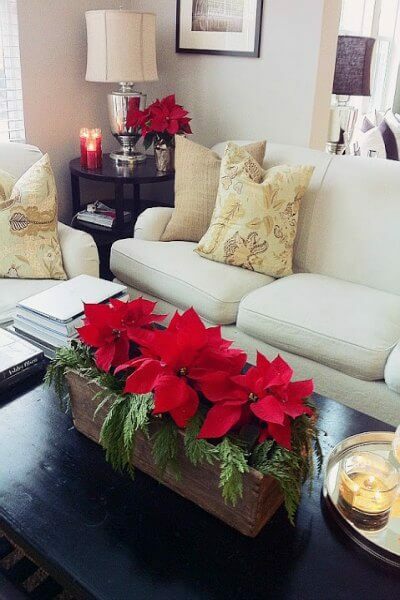 Use a rustic box to hold poinsettias for a beautiful centerpiece. This would be lovely on your table, coffee table and more! 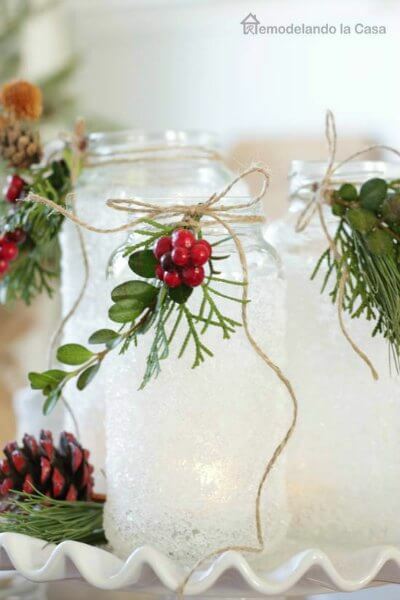 Fill glass jars you have at home with leftover ornaments. Crafts that use what you already have at home are my favorite and save time and money! String ornaments to make garland. This is such a creative use of ornaments and a fun type of garland to spruce up your house for Christmas. Everyone loves Hershey kisses! 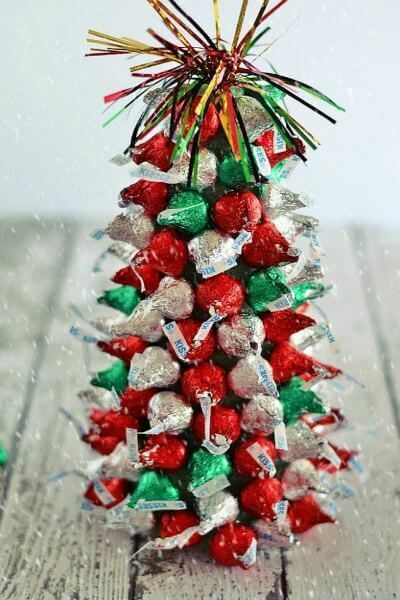 Use Christmas ones to make an adorable tree for your table! 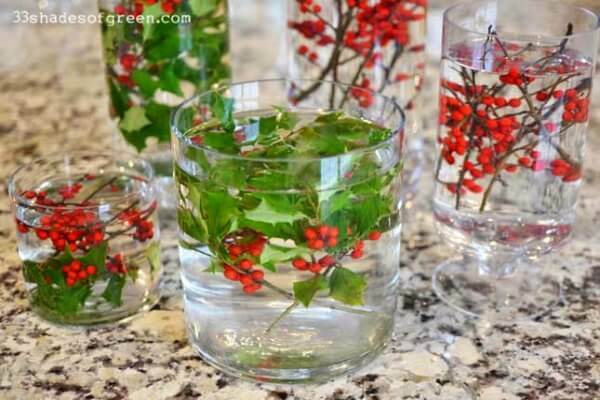 Float greenery and holly in glass vases and containers to make really lovely centerpieces. You could also use floating candles to add a special touch. Candle wreaths full of greenery make this table ready for Christmas. The pop of red from the runner is stunning. Use what you have or shop your local dollar store for a few more items. 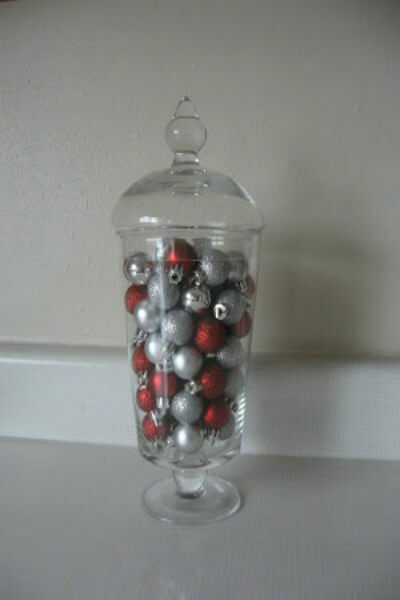 Fill a tall jar with ornaments for a festive display. 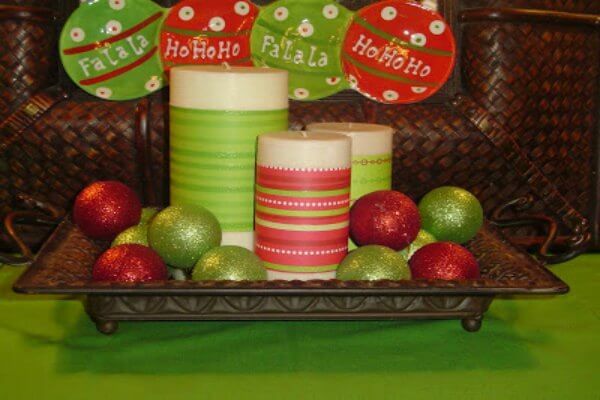 Spruce up plain candles with ribbon in holiday colors. This is a great way to use inexpensive candles and make them part of your decor. Fill lanterns with ornaments for a gorgeous centerpiece. I think it would also be pretty to put in some battery operated twinkle lights in there. 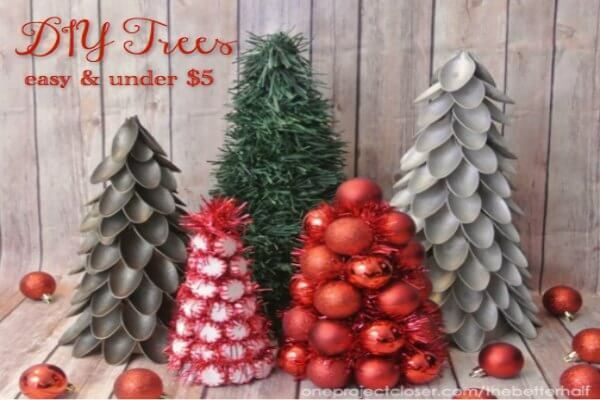 You will never believe these little trees are made of plastic spoons! If you are looking for an inexpensive idea, try this! They are so cute. Use epsom salt to make bright and festive luminaries. The soft light will make the setting! 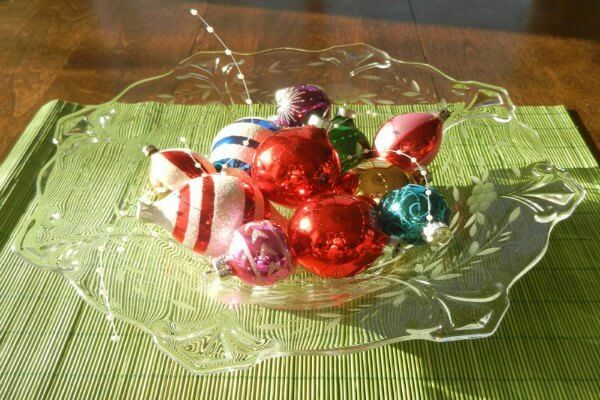 Put ornaments in a pretty glass bowl. It’s that simple! Use old wine bottles to make a centerpiece with flowers and candles. 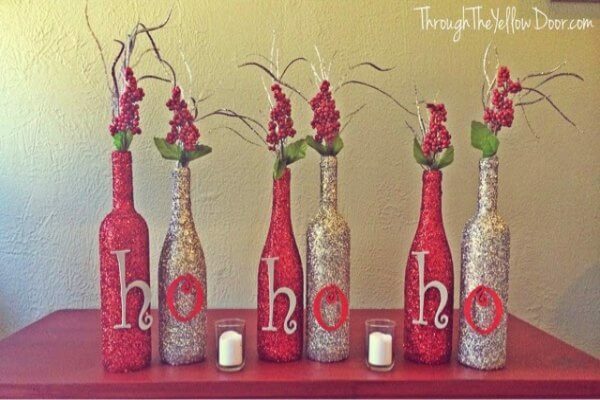 Use glitter to make the bottles perfect for Christmas. Use a rustic planter or box to fill with greenery, berries and pine cones. This is gorgeous and so simple while leaving a big impact. 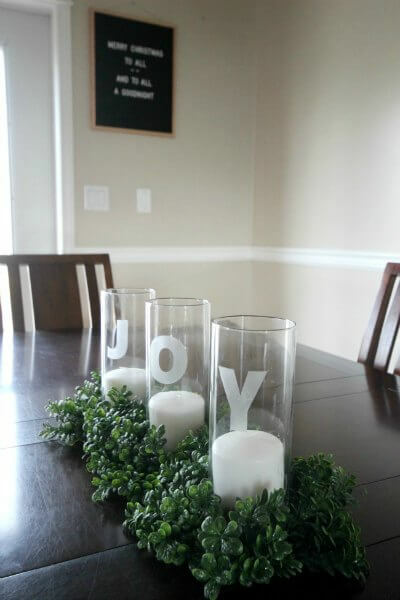 Spell “JOY” with this etched glass centerpiece. The greenery is simple around it but contrasts so nicely with the white candles. Apples and greenery come together for a simple yet elegant centerpiece for your table. This idea is perfect for dinner parties. 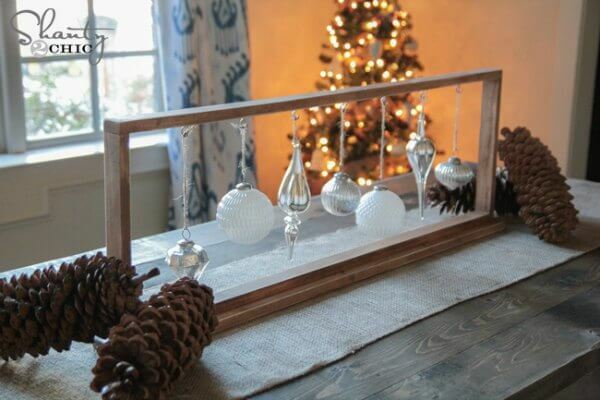 Make a pendulum with ornaments for the holidays. Use colors that suit your decor and this will be the perfect Christmas center piece. Make this reindeer centerpiece from the most simple items you probably already have. Add a red jingle bell to complete the look and you are set. Cuts of wood make a gorgeous and rustic centerpiece. Top with greenery, old cars and more for this look. 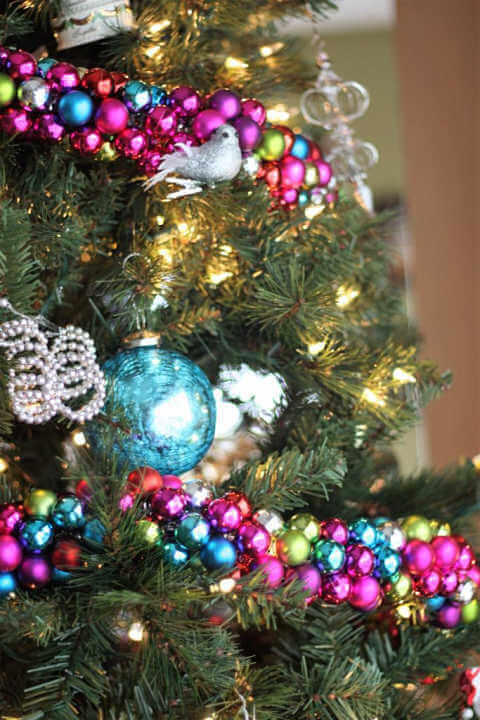 Make a tree out of ornaments. Alternate the colors that match your decor for a beautiful tree. 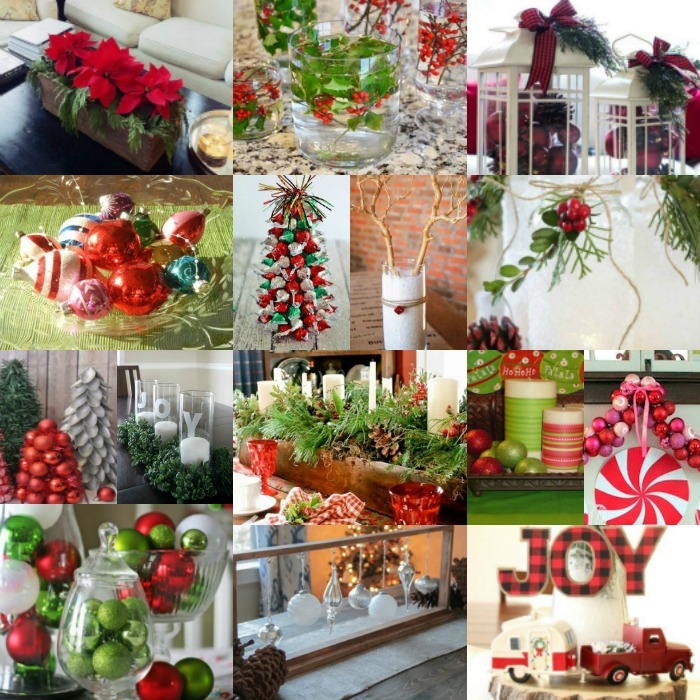 Which of these Christmas centerpieces ideas do you plan to try? 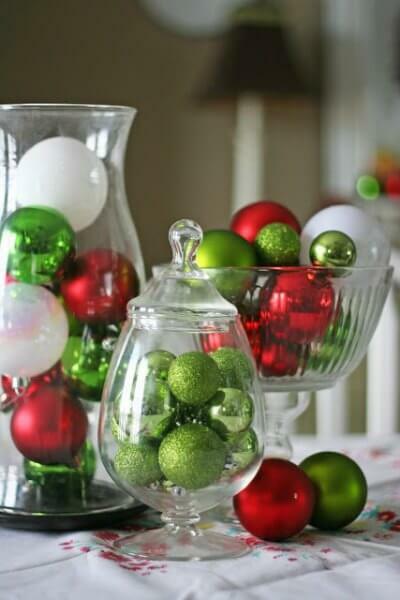 These homemade Christmas centerpieces are not just fun to do but so simple and gorgeous. Many of these ideas you can even get the kids involved. They will have a blast helping and you will make such special memories together as a family. If you enjoy making things, you will definitely want to learn how to make a string ornament that is simple but gorgeous with this easy tutorial. It is so easy to make and budget friendly when all the supplies are from the Dollar Store! We have a blast looking for new ideas and seeing what all we can create. It is fun to make an afternoon of it. Everyone has a blast and gets to make some pretty amazing DIY creations while making even sweeter memories! Once you start making your own decorations, you will be hooked. Come back and leave a comment letting us know how they turned out! Learn how to make glue and you will also save a ton of money! We are always making something around here so this has been a big help having this glue on hand to use. Not only does it save us time since we not have to run to the craft store but it also saves us money. Yeah! It’s that time of year when we want to spruce up our homes for the holidays! Learn how to make a burlap wreath for Christmas and it is so simple to do. 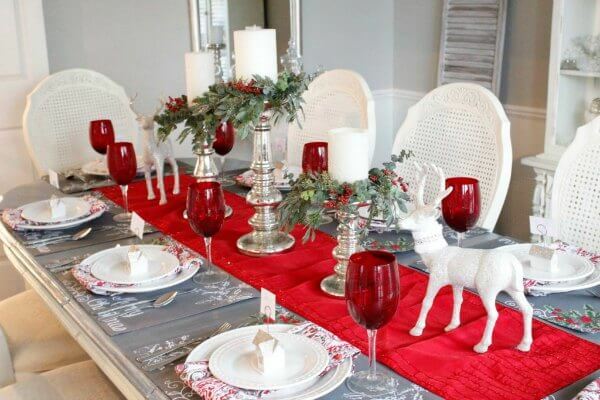 Find 15 DIY Christmas Table Decorations sure to set the mood for your holiday dinner.